The former Seattleite and Boeing engineer’s new show, which tackles climate change, vaccinations and more, starts streaming Friday, April 21. Formatted as a half-hour, single-topic, science-themed talk show, the 13-episode first season — debuting Friday, April 21, on the streaming service — devotes episodes to Nye’s favorite subjects (climate change, GMOs, vaccinations) and topics that took him more by surprise (video-game addiction). The 61-year-old Nye was based in Seattle from 1977 to 2000 before moving to Los Angeles (“Bigger pond, more opportunity,” he said of the move). But even today he still sees a primary-care physician in Fremont. Nye said the key to getting him to headline a new series was executive producer Michael Naidus. Nye was recruited out of college to work as an engineer for Boeing in Seattle, landing in flight control systems on the 747 line. He left Boeing after a few years but stayed in engineering at various Seattle firms for another 20 years while in his free time trying his hand at stand-up comedy, after winning a Steve Martin look-alike contest in 1978. Nye crossed paths with John Keister of local sketch-comedy series “Almost Live!” at an open mic night, and Keister invited Nye to appear on the program, and the Bill Nye the Science Guy character took shape during Nye’s tenure from 1984 to 1991. 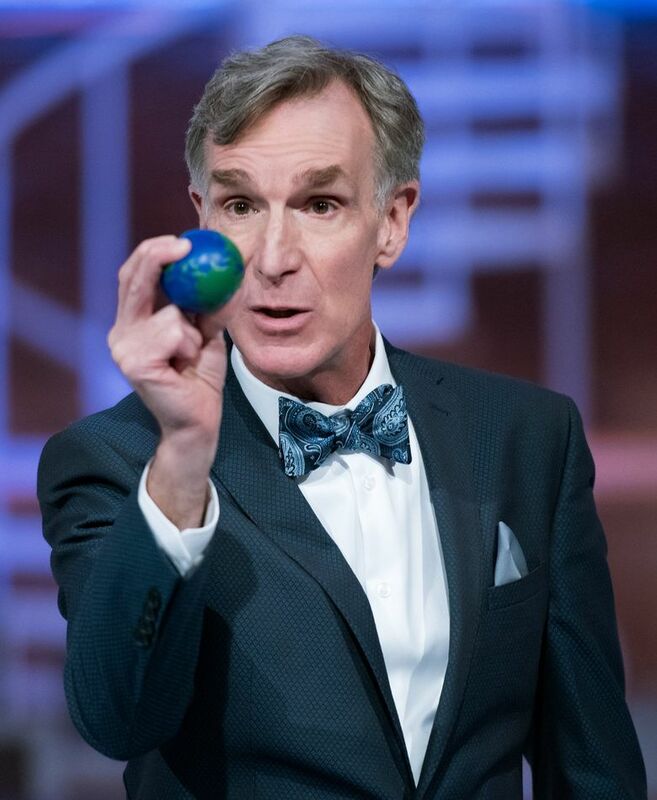 Nye took the character national in “Bill Nye the Science Guy,” which originated at Seattle’s KCTS and ran from 1994 to 1999 in national TV syndication. He followed it in 2005 with KCTS’ “The Eyes of Nye,” which lasted a single season. Another misstep on that series: His wardrobe. The bow tie and powder-blue lab coat are back in “Bill Nye Saves the World.” In his climate-change episode and two other installments, Nye is joined by towering model Karlie Kloss, who serves as one of the show’s special correspondents. Nye said he hasn’t gotten more political in recent years, just frustrated with politicians who ignore science at the planet’s peril. “Bill Nye Saves the World” is geared to adults more than the audience of kids who watched “Bill Nye the Science Guy,” but Nye said Netflix is really aiming at “Science Guy” viewers who are now grown up.